Glengoyne's name was originally spelt "Glen Guin" - "Valley of the Wild Geese". Glengoyne Distillery is open to the public; has a substantial Visitor Centre and shop, and offers seven different tours costing from £9.50 to £150. Open daily throughout the year.Tours run on the hour. Advance booking required for Master Blender, Masterclass and Century of Whisky tours. AS with all the tours, the Glengoyne Tour (£9.50) starts with a 12yo dram; for £12.50 the Wee Tasting Tour adds a dram of 18yo to finish with. The Gold Medal Parade (£26.50) adds the 21yo and Cask Strength - and a complimentary glass. Also for £26.50 the Whisky and Chocolate Tour ends with the 15yo and 21yo being paired with four handmade chocolates from Iain Burnett. Upping the price to £65 the Malt Master Tour, includes "an incredibly in-depth tour", and then you get to "create your own single malt in the Sample Room", which you get to take home with you in a 200ml bottle. The £80 No.1 Warehouse Tour allows you to savour "healthy drams" drawn from a first fill bourbon and first fill sherry cask, savour them in the Sample Room - and draw a 200ml sample from your favourite to take home with you. The ultimate tour - The Masterclass costs £150 and "Over the course of the five hours, you’ll taste five Glengoyne whiskies, plus a range of sherries. You’ll also create your own single malt." (as in the Malt Master Tour). The last three must be booked in advance by contacting the distillery. The other tours can be booked in the website. Glengoyne styles itself as "Scotland's Most Beautiful Distillery", and while several other distilleries would probably dispute that claim, there are plenty that are less beautiful. 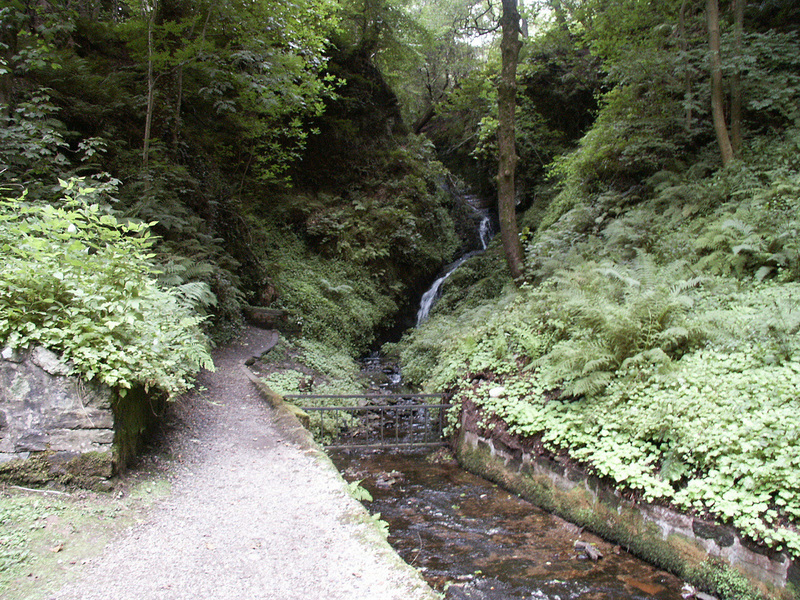 The waterfall, reservoir and hidden glen behind the distillery, which you are invited to stroll around after your tour, cannot compete with Glen Grant's famous garden, but is easier to get to. 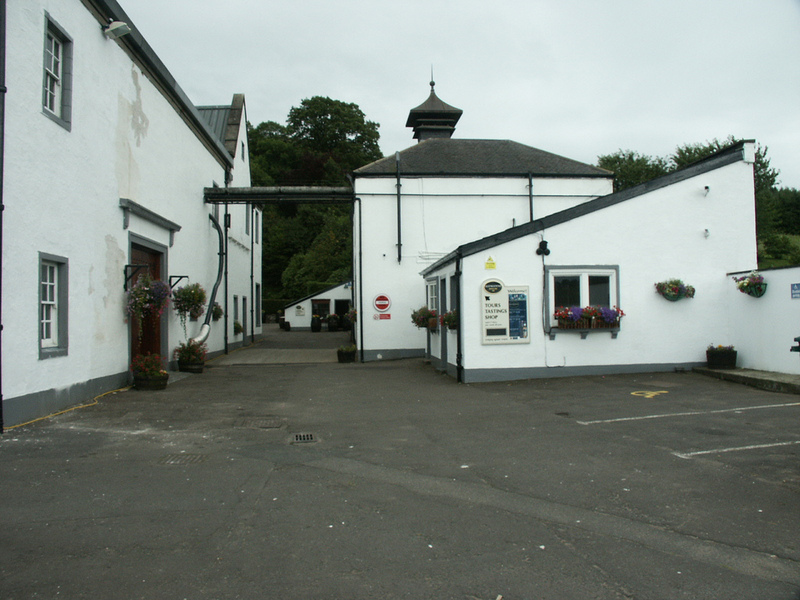 Misako Udo states that the distillery was initially known as Burnfoot of Dumgoyne, then Glen Guin, and Glenguin before the present spelling was adopted in 1905. Though the official starting date for the distillery is 1833, that is when it was first licensed - the website gives an 1820 date as the start of its timeline, "George Connell begins distilling in secret at Burnfoot Farm..." though it goes on to suggest that "He’s not the first to distil here illegally – it’s reckoned George learned the stillman’s art from his grandfather." The distillery went through several owners until being sold by Lang Brothers Blenders to Robertson & Baxter (now Edrington) in 1965. They had no further use for it in 2003 and sold it to independent bottler Ian MacLeod Distillers. 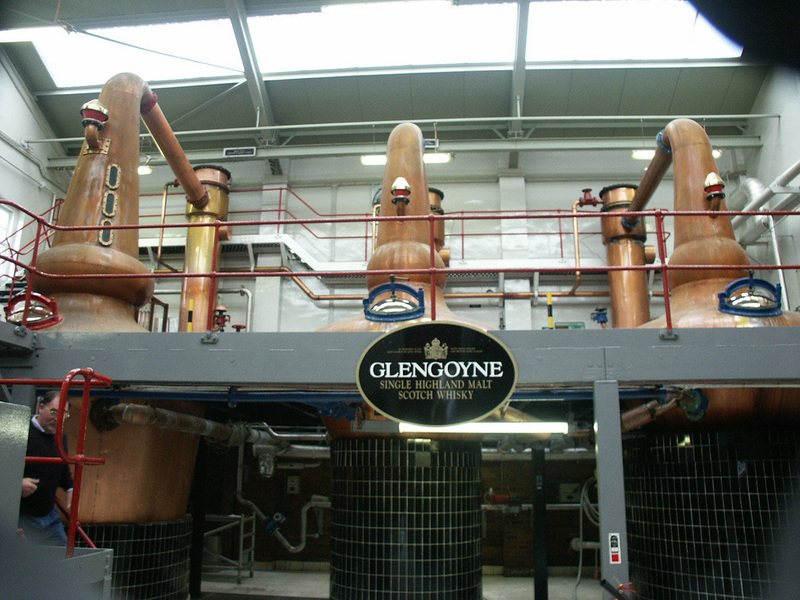 Glengoyne lies close to the Highland/Lowland divide, but is legally a Highland distillery. The myth is still perpetuated in some places (eg scotchwhisky.com and RMW) that the road outside the distillery is the boundary between highland and lowland, and therefore the distillery itself is in the Highlands, but the warehouses are in the Lowlands. The road is actually at right angles to the boundary line (Cardross Station to the summit of Earl's Seat, in this area), and passes just to the South of Glengoyne. Ian MacLeod Distillers bought Tamdhu distillery in 2011. They have also announced plans to re-open Rosebank Distillery. The brand's crest was redesigned in 2012 for the release of a new range of whiskies, to incorporate two geese, reflecting the origin of the distillery's name. 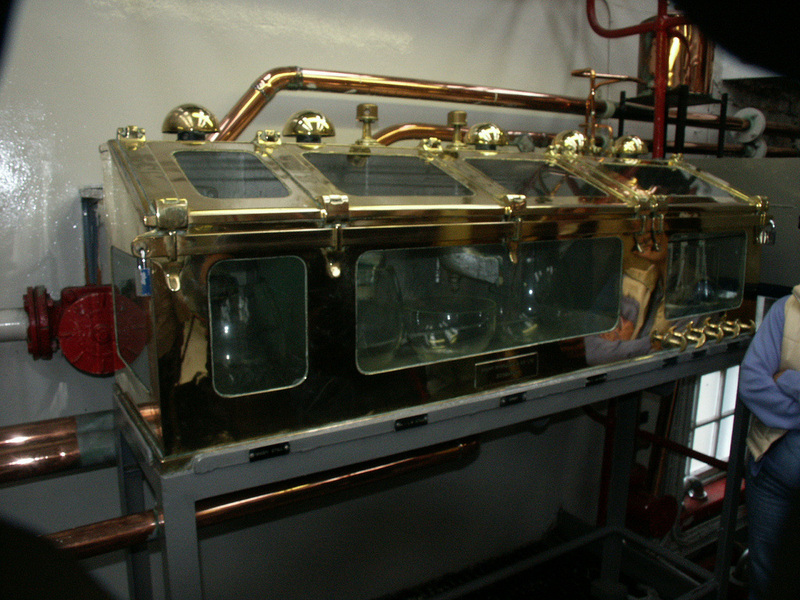 The distillery prides itself on using no peat whatsoever in its malt production. Nearest station - Milngavie (MLN) (7 miles); Balloch (BHC) (11.5 miles) (Live Train Times: MLN, BHC). Both are terminal stations, so easy level access to platforms. If you do go via Milngavie it's pronounced Mulguy. The West Highland Way (which also doubles as the John Muir Way at this point) passes the distillery on the track bed of an old railway. You can cycle along the WHW, but the terrain in places may be challenging unless you have a mountain bike - and the weather will also be an issue. 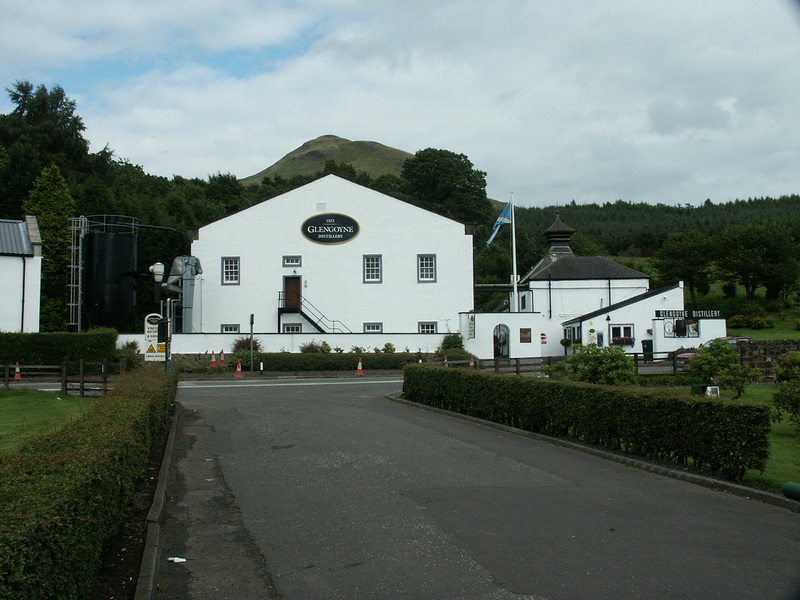 Glengoyne Distillery is a couple of miles north of Strathblane on the A81. Glengoyne core range consists of 10yo, 12yo 15yo, 18yo, 21yo, 25yo (48%) and Cask Strength (bottled iin batch es around 58%-59%). The 10yo is bottled at 40% the other aged bottlings at 43%, except the 25yo. Special bottlings, including the excellent Teapot Dram - cask strength around 59%. Independent bottlings not that common. 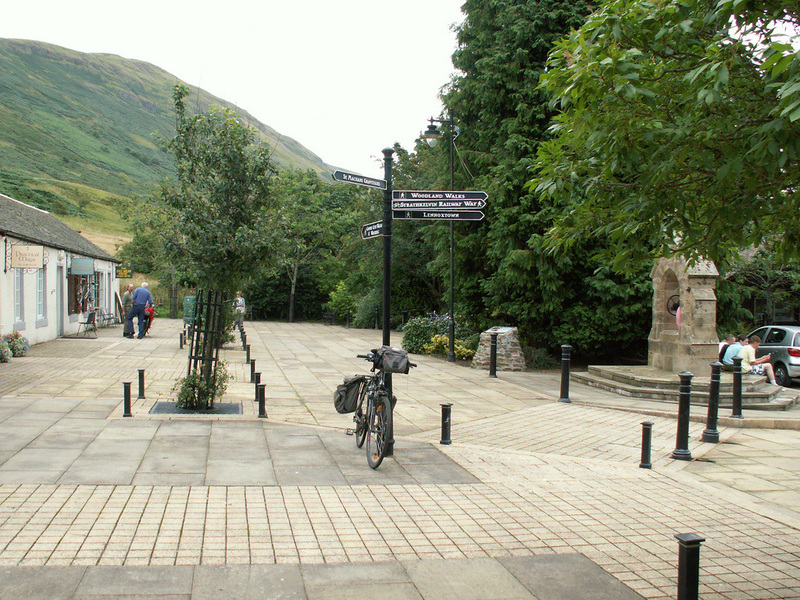 Clachan of Campsie is a small village at the foot of Campsie Glen, with a few shops, one of which is run by Big Al, who specialises in wheel-building, but also does repairs and sells bikes and parts. They were able to repair my wheel after suffering a few broken spokes - while I waited. There's also a coffee shop there to wait in, or you could explore Campsie Glen. Excellent Service. Closed on Sundays for religious reasons - Al religiously goes cycling on Sundays! Photos on this page were taken by me. Click on photo to enlarge. Full size versions of all my photos of Glengoyne Distillery are on Flickr.